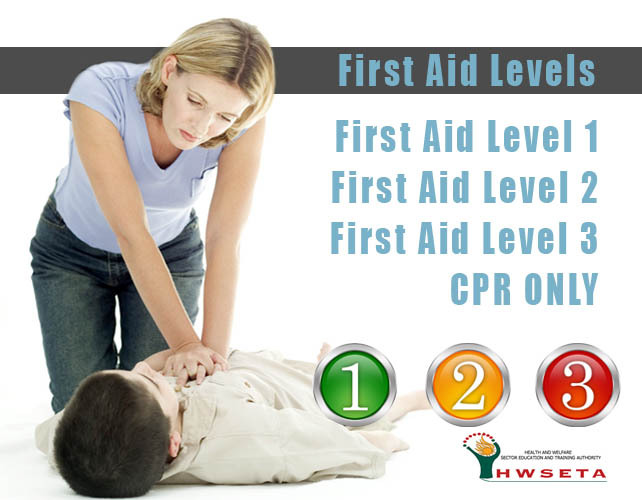 First Aid Levels of Training in South Africa. Get A Free Quote Today! We provide all three levels of first aid. We also have a basic CPR refresher course. Below we will provide you with a quick synopsis of every course. This might make it easier for you to understand what option will work the best for you. In Level 1 First Aid, you will be taught mostly practical. This is probably the most important level for a person that does not want to make first aid a career. You will learn everything required to stop bleeding, treat fractures, burn wounds and CPR. This means that after qualifying for this course, you will definitely be able to help a person in need. We suggest this course to people that only need to know the basics. This course can be attended by children and teachers. Level 1 First Aid consists of a practical examination. You do not have to be literate to attend this course. In Level 2 First Aid, you will learn everything in theory. The theory will simply explain the logic behind some of the practical exercises you have learned in level 1. This course includes child and infant CPR. Ideally this course should be attended by nannies, new parents and employees of companies with high risk. To qualify for level 2 First Aid, you need to have a valid level 1 certificate. If you have not done level one yet, you can combine the two. We do offer discount if you combine our courses. You will have to be literate. There will be a written exam before you can get your qualification. In Level 3 First Aid, you will learn in depth theory on everything you learned in level 1 and level 2. This course will mostly be attended by students that want to make first aid a career. You will need at least a St7 (Gr9) qualification in order to attend this course. The Level 3 First Aid course aims at theory. You need to know how the body works, not just how to treat injuries. We offer a course to update you on the CPR process. It’s a lot of steps to remember, and if it’s not practices, it will be forgotten. This is a 3 hour refresher course. We suggest taking this course every 6 months. By attending this course regularly, you can ensure that if you need to apply your skills, you have the confidence to do so. This course can be attended as a stand alone. However, we do not suggest taking the CPR only course without at least level 1. This is an attendance course and does not replace a valid first aid level 1 certificate. We do provide other related courses. We provide safety, fire or other industry training and services. If you need any further information regarding our training or company, don’t hesitate to contact us. We can do on-site training if you have more than 10 students. If you are an individual, we will arrange your training on an existing date. We do our best to be as flexible as possible. If you have special needs, we will do our best to accommodate you.